The amount of companies in business today in the outdoor industry is absolutely amazing. What you really see at a show like this is how fierce the competition can be between companies and that only makes it great for you and I, the consumers of all of these great products and services. Our coverage continues! Here is another example of a forward-thinking ammunition company. From their PowerStrike ammo line to their HogStrike ammo line, this is some incredible ammunition to use for self-defense and hunting as it comes in both handgun and rifle calibers. What’s more is that their new SilentStrike ammo is the world’s only full functioning .223 subsonic round that will operate in the AR-15 platform at 975 FPS in semi AND FULL AUTO. That’s really cool! They had some videos in their booth of this round coming out of an AR-15 in full auto configuration and it performed flawlessly. For Texas, the 80 grain HogStrike ammunition comes in .223 and is designed with a powder metal core that easily penetrates thick hide. Before encountering this company, I didn’t think you could load a .223 heavier than about 62 grains as many of the large ammunition companies have come out with over the years. Allegiance is doing some ground breaking stuff here and I am excited to see this ammo in action in my own AR. They claim this .223 round has more knockdown power than a .308! And to think some folks look down at using a .223 round for more than varmint and predator control or simple range plinking! I can’t wait to try some on a ranch where I regularly hunt hogs here in Central Texas. I have long believed that shot placement is everything and have taken numerous deer and wild hogs with a .223 over the years. This ammunition will make me even more confident in my shooting. Check these guys out at www.allegianceammo.com. Last year when I went to the NRA Show in Louisville, Kentucky, I wrote about STI Guns. This company is a pioneer in performance handguns and they specialize in the 1911 platform and their own proprietary 2011 models. I had a chance to shoot one of their handguns from the DVC model series at a local range day event promoting the Texas Firearm Festival (http://www.texasgunfest.com) last year and fell in love with the quality and performance of this gun. It is by far the easiest and most accurate shooting 1911 platform gun I have shot in 9mm and I, like some of you, have owned and shot a bunch of handguns over the years. STI offers a wide range of performance custom handguns and, while they’re not the least expensive option out there, I would certainly consider them some of the best made and highest quality handguns on the market. This is yet another Texas company, right down the road from me here in Central Texas! Check them out at www.stiguns.com. I was first introduced to this company at the last NRA Show and ran into one of Desert Tech’s field reps while enjoying a beverage downstairs from my hotel room. These guys specialize in manufacturing one of the best long range bolt-action rifles I have ever seen on the market. I was very impressed by these guns from the moment I laid eyes on and held one of these rifles last year. The unique thing about Desert Tech’s bullpup-style bolt-action design is that you can change barrels in around one minute. How many other precision long range rifles on the market can do that? Aside from these fine rifles, they also make supressors and ammunition. Their newest rifle, which has been all the rage in the firearms circles I run in, is the MDR, or Micro Dynamic Rifle, which is a new class of bullpup semi-automatic rifles that is just hitting the market this year. This groundbreaking rifle system comes chambered in .223, .308 and 300 Blackout and is portable, adaptable and ambidextrous. Their slogan is “Tommorrow’s Weapons” and they are definitely that for sure. I am excited to see a company like this compete in the market with other “normal” weapon systems as they rise head and shoulders above many other well-known brands in the firearms market. I also reviewed DT’s proprietary long range shooting Smartphone app called TRASOL on FishGame.com some months back. It is one of the best apps of its kind on the market. Check them out at www.deserttech.com. 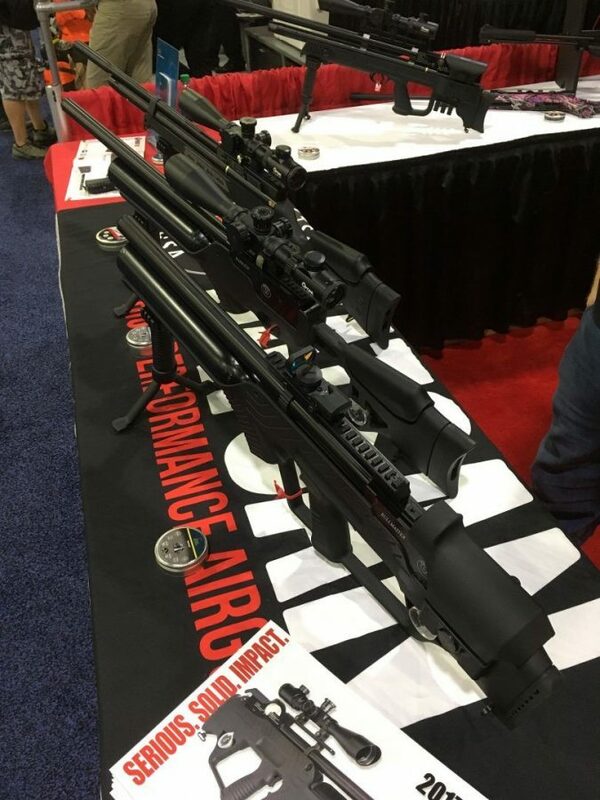 If you have read my other articles and blogs, you will know I am a big fan of airguns and I am continually impressed with the innovations in big bore and small bore airguns. We talk a lot about airguns on The Best of the Outdoors, our Texas Fish & Game podcast, which I host and I invite you to be a listener. What’s new with Hatsan are two semi-automatic bullpup-style airguns called the “BullMaster” and the “Barrage”. These innovative air rifles are groundbreaking as there are few on the market like them in the airgun realm. Chambered in .177 or .22 caliber, I would consider these guns as great squirrel or rabbit guns as they offer quick follow up shots without having to work a bolt or any other part of the gun which is great for follow up shots on small game or even varmints. What’s more is that these rifles feature two picatinny accessories rails – one on the top for a scope and one on the bottom for a flashlight or other accessories. These guns also feature QuietEnergy Barrel Technology which is an integrally suppressed system to keep the noise down. In big bore, Hatsan sports the “Hercules” which comes in .30 cal, .35 cal, and .45 cal. but they also have small bore offerings in .177 cal. to .25 cal. Things keep getting better and better in the airgun world and my goal in the writing, video and podcasting work I do is to bring more awareness to airguns as they are clean, powerful and just plain fun to shoot! Check these fine airguns out at www.hatsanusa.com. Dustin Ellermann (the other Dustin of Texas Fish & Game!) and I went to SHOT Show Range Day together this year and had the chance to both shoot the Maxim 9, which is an integrally suppressed 9mm handgun and the first of its kind on the market. While I have written about this gun before as looking like something from the movie Robocop, seeing that this gun has a very futuristic design, the Maxim 9 garnered my attention initially as SilencerCo came out with something no other silencer or gun company has been able to produce. This dynamic handgun is available in either short or long configurations and both are a breeze to shoot and it turns out that both the long and short configurations are hearing safe when shooting sub-sonic ammo. Another product I had the chance to see at the NRA Show and shoot at Range Day at SHOT was the Omega 45K suppressor. This is yet another great example of a well-made silencer by this company. This suppressor comes in a fully welded, tubeless configuration so it reduces sound dramatically and it’s also a small and lightweight can. Check these guys out at www.silencerco.com. This company has a great slogan: “We didn’t invent concealment, we just perfected it.” DeSantis offers conceal carry holsters for numerous models of handguns, hunting holsters, belts and many other high quality products. I have been a fan of this company for a while now. While we can open carry or conceal carry now in the great state of Texas with our License to Carry laws these days, the options for doing either are numerous with this company’s offerings. Not only can you be sure you are carrying your handgun in a durable and secure holster, you are also doing it in style! You’ve never looked so good before! There were so many great products at this booth at the show and it is hard to pick a favorite. One thing I do know is that this is a family owned business which started from humble beginnings over 40 years ago and it is the perfect example of an American dream. DeSantis continues to impress me with their attention to each and every detail that goes into the quality of their workmanship. If you are looking for a new holster, belt or hunting accessory and like the look and feel of leather, check these guys out at www.desantisholster.com. Please stay tuned to www.FishGame.com for more coverage of the NRA Show!